Ahhh, it is the time of the year where there is nothing on the TV in the evenings and the TIVO is full of poo. All of the short summer series are over, but most of my favorite regular season shows don’t start for another week or so. Usually at this time of year I would be watching more Orioles games as background during my stitching time, but because of the stupid Washington Nationals (i really don’t have anything against the Nats) I often can’t get Orioles TV broadcasts. For some reason, TV executives determined that the moment that the Nats moved to Washington, every Orioles fan south of the Potomac River would undergo a spontaneous transformation and become Nats fans. There are still some of us who still love the O’s despite the 2 hour drive to Baltimore and we miss getting the games. This is especially true for me as I grew up going to O’s games and by the time I got into baseball, no one had hope that baseball would ever return to Washington. As a result of all of this television chaos, I am watching football. Insert questioning noise here. I am not really big into football, but what else am I to watch while I stitch. Proof that I am not really a football fan…my “brother” runs a football pickem’ pool every year and always invites me to join. Each year I enter my picks with some amusing twist. This year my team theme is let me ask my cats. I am letting Cooper and Zoe advise me on my picks this year. We shall see how well I do. 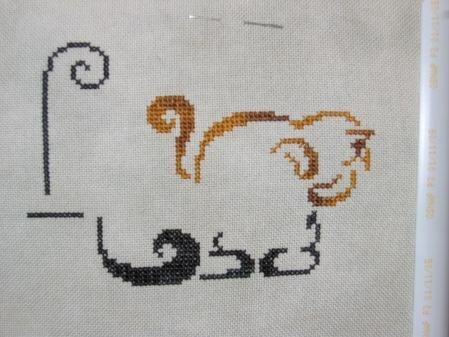 And now on to stitching. Most of the week i worked on White Wedding. I didn’t take a pic as it really didn’t look like much. Tonight, I worked more on Butterfly Rest. 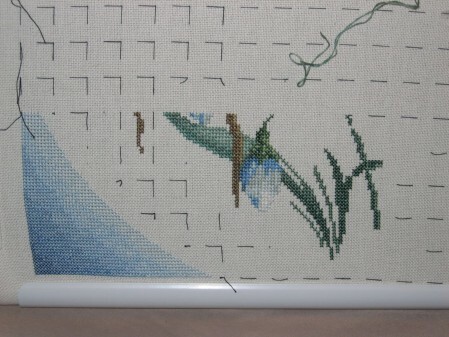 I actually got more done that it looks like as I had to frog a huge portion of the flower stem…yuck! I really like this piece. Great pieces. Is Butterfly Rest a HAED? I hear you on the stupid TV baseball schedule. I’d actually like to follow the Nats but we get 20 games per season on our cable channel, but all the Orioles. You and I need to swap houses! Good luck for the football picks. Your brother is going to be hopping mad if the cats beat him! ROFL at “let me ask my cats.” I hope Cooper and Zoe give you some good picks so that you can irritate your brother. 😉 Sorry you can’t get your O’s games anymore. The Nats are a big deal in the area, so it doesn’t totally surprise me. Some choice would be nice, though. Butterfly Rest is looking nice. Sorry you had an attack of the frogs. And Brotherly Love is so cute!